Flight (1903) - On December 17, 1903, after thousands of years of watching birds soar through the air and dreaming of defying the pull of gravity, mankind finally left the confines of earth and achieved sustained controlled flight for the first time in history. Two Ohio natives, Orville and Wilbur Wright accomplished this in their aircraft, dubbed the Wright Flyer, near Kitty Hawk, North Carolina. Today we fly aircraft around the world and even send ships into outer space; but that first flight lasted only twelve seconds and covered 120 feet (37 m). One of the keys to overcoming the challenge of flight is called wing-warping. Like most people fascinated by the concept of flight, the Wright Brothers began their research by studying birds in the air and noticed that their wings had an upward curve that enabled them to "capture" air and keep them aloft. This created an imbalance of pressure; less above and more below the wings, and allowed the birds to generate lift in order to overcome gravity which tends to keep us earthbound. 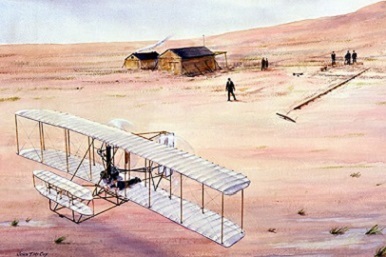 Based on their observations (and work done by other aviation pioneers), the Wright Brothers started building gliders that could stay aloft for several minutes using the power of wind. Once they felt that they had the design right, they added an engine which turned propellers and allowed the "airplane" to fly under its own power. Thanks to the invention of the jet engine, airplanes can now fly well in excess of the speed of sound.